So stay tuned for more news as Easter texts us to let us know of his new and exciting genealogy adventures. It was an exciting day last Thursday. My 23andMe DNA results were in. I had previously sent for 3 DNA kits - one of each for hubs, my brother and me. So when the email arrived from 23andMe I had the fun of going through all 3 sets of results. Phew! I won't pretend I understood it all but it is fascinating. We are all going to have to do some more reading on DNA to understand it all, so I concentrated instead on the health results. It's pretty impressive. 23andMe DNA shows if you have any at-risk or higher than average risk factors, which of course does not mean you are going to get that specific disorder but might just make you more aware of watching for symptoms. Our reports showed if we were carriers of certain disorders and if we might have sensitivities to certain drugs or treatments. I learned that both my brother and I have bitter taste receptors that hubs does not have. All in all the health and medical reports were quite detailed and provided our individual risk % compared to the average. I'm still going over them! and drugs to which you are likely to have an atypical response based on genetics. There is also detailed information on each disease that is labelled as greater than average genetic risk and suggestions of life-style changes that might reduce the risk. Of course there were the standard paternal and maternal Haplogroup determinations and so on but I'll talk about those in a future blog post. Not all of our details are in for this part of the testing. Let me end with the amusing finding that my brother's has 2.6% Neanderthal DNA, hubs has 2.8% and I have 3% which puts me in the 86th percentile! Wow I can't believe I'm more Neanderthal than my brother but genetics doesn't lie. I encourage readers to join in. Lisa has some terrific blogging prompts for each day of Women's History Month. Choose one female ancestor and the historical context during her life. Pick one historical event that would have impacted on her life. Perhaps she lived through the Spanish influenza in the early 1900s or she was widowed during the Civil War, or lived through the Depression? Every ancestor has a story to tell and this is a great opportunity to tell about one of your fearless female ancestors! This was an easy choice for me. I often think about my 5th great-grandmother Anna Maria Warner. Anna Maria was born to a Palatine family in Schoharie New York in 1735. At the age of 22 she married Isaac Van Valkenburg who later took the surname Vollick. Shortly after the American Revolution broke out, Maria's husband Isaac took the side of those loyal to the King and joined Butler's Rangers. He was arrested on three separate occasions and sent to prison in Albany. The family was living near North River in northern New York, and when Isaac was released from prison he left with the Rangers and Maria was left alone with ten children. Maria continued to aid the British, and in 1779 she and her children (the youngest only four years old) were taken from their home in North River and made prisoners by American patriots. Their home was burned and Mary and the children were marched 80 miles north through the forest and left in destitute circumstances. With the help of Indians from Canada, Mary and family made their way to Canada and reached Montreal Quebec by July of 1779. How she managed to keep going with seven young children is a testimony to her strength and courage. Her oldest child was her 19 year old daughter, her youngest only 4. She had no way of knowing where her husband and older sons were, nor even if they were alive or dead. And she had no family support except her children. Once in Quebec Mary and her children received minimal food rations, and were provided with lodging and blankets from the British Government. They had nowhere to go and with other refugees lived under these crowded conditions for three years. 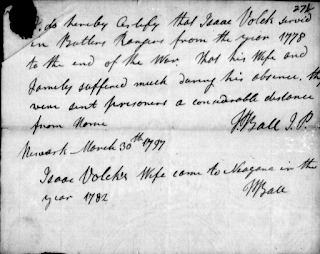 Finally in 1782 Maria reunited with Isaac and they settled in the Niagara area as impoverished Loyalists. Ontario was a wilderness at that time and the Niagara area had no settlements until the disbanded Rangers were sent there. They arrived with nothing, all their lands in New York having been confiscated. Can you imagine living and working the land for over 20 years and suddenly you are tossed out, your home burned in front of you and with only a few blankets you are marched into the woods and left to either die or make your way to a land you have never seen? Then you live for 3 years in hardship and finally reunite with your husband, only to be sent out to the wilderness with only a few Government promises, most of which were never kept. The following submission to the House of Commons in 1786 describes the grave situation in which Loyalists found themselves. "It is impossible to describe the poignant distress under which many of these persons now labour and which must daily increase should the justice of Parliament be delayed until all claims are liquidated and reported. Ten years have elapsed since many of them have been deprived of their fortunes, their helpless families reduced from independent affluence to poverty and want." To top it off, five years after arriving in the Niagara area, the disbanded Loyalists faced starvation in what became known as "The Hungry Year" , the winter of 1787/1788. Settlers faced crop failures, shortage of food and a severe winter. Game was scarce and many people died. With the coming of spring new leaves on trees were gathered and eaten. Roots were dug out of the ground and eaten. Bark of certain trees was stripped off and consumed as food. Those were the conditions Maria and her family faced some 12 years after being forced out of their home in New York. Did her suffering never end? What a strong brave woman she must have been. And I am so proud to call her one of my Fearless Female Ancestors. In this video I show you how to work with text boxes and embellishments, and how to rearrange book pages. • Six nights at the Holiday Inn Rosslyn, which includes daily continental breakfast, free Internet in rooms, and parking. Costs do not include either the transportation to Washington, DC, or within the city, or any other meals other than those shown above. The package price varies depending upon room occupancy and National Genealogical Society membership status. Payment is required in full at the time of registration. 1. Communicating with matches is even easier. Now when you correspond with a DNA match, there’s a direct link in the email message that lets you quickly locate that match in the future. No more paging through your match list. Just click the link, and it will take you directly to the details for that match. 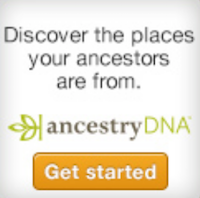 Ancestry DNA web pages now work seamlessly on your smart phone and tablet. No app download required; just access your DNA results through your web browser on your smart phone or tablet as usual. 3. Raw DNA data download. Some genetic genealogists have requested the ability to download their raw DNA data. And now you have the option to download your raw data by logging into your account, going to your DNA results page and clicking the “manage test settings” link. Yesterday I uploaded two video tutorials to Olive Tree Genealogy Channel on YouTube. The tutorials walk you step by step through creating a beautiful Photo Memory Book for your family tree. There are more video tutorials to come in this series so be sure to keep an eye on the YouTube Channel and on this blog for announcements. Here are the first two in the series. I hope they are helpful! It's the last day for RootsTech. Which Sessions are you going to watch today on their live stream? Here are today's sessions for Live Streaming. I am determined to catch Denise Olsen's Digital Storytelling and hope to watch the others live too. Which RootsTech Sessions are you going to watch today on their live stream? Yesterday I saw part of the Keynote speakers - excellent! And I managed to watch Jill Ball's panel on Genealogy Gadget Bags. The panelists did an excellent job, as did the panelists on Thomas MacEntee's Panel on the Future of Genealogy. Here's the list of what's coming today! I hope I can manage to watch Valerie Elkins session at the very least. Of course I'm going to try to watch as many as possible. If you can't watch them live, they are being archived so you can catch the sessions later. Just go to Rootstech.org and enjoy! 4. Do you have a female relative (direct ancestor or collateral lineage) who played an active role in women's issues? Perhaps one who was a Suffragette or was a pioneer in a male-dominated role or occupation? Perhaps she sailed to the New World to start a new life in the 1600s or was a refugee from a war-torn or religious-intolerant location. Tell her story in a blog post or comment here on this blog. So many to choose from! There are my Palatine female ancestors who fled the Palatinate area of Germany over religious differences and sailed to New York in 1710. Out of approximately 3,000 who fled to a new land, almost 500 died on the way. Once in New York their mistreatment continued, this time at the hands of the British who forced their husbands and sons to work on British Tar Ships in situations not unlike slave labour. Their children were taken from them and given into indentured servitude to wealthier families. Or my Irish female ancestors who left Ireland during the Potato Famine in the 1840s? My 2nd great grandmother Fanny McGinnis (nee Downey) was one of those women. The hardships many of my female ancestors endured is beyond imagination and I admire their courage and resilience. 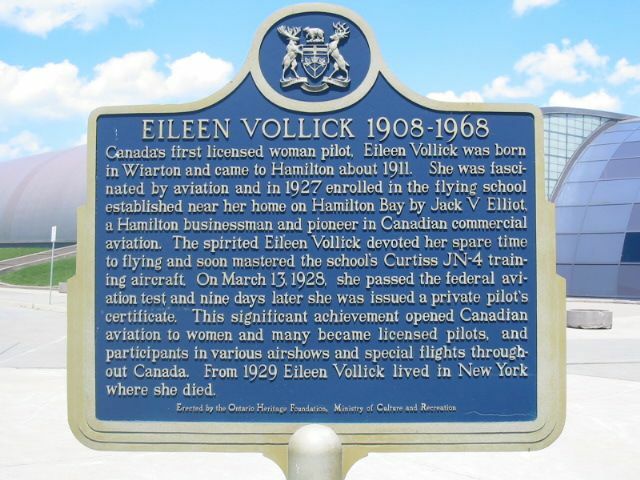 But I'm going to talk about my cousin Eileen Vollick (1908-1968) who became the first Canadian woman to obtain a pilot's licence in March 1928. Yes she was just 20 years old. Eileen was related to me in two ways, and was also my 7th cousin twice removed. 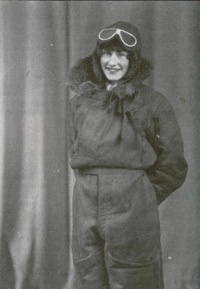 Eileen received numerous honours over the years, including the Amelia Earhart medallion in 1975. 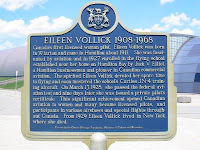 In August 2008 over 250 people gathered to mark her contribution to aviation on the 100th anniversary of her birth in Wiarton. 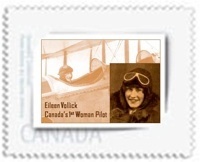 She also was honoured with a Canada Post stamp and the naming of an airport terminal after her. RootsTech Live Streaming Starts Today! Which RootsTech Sessions are you going to watch today on their live stream? Here's the list of what's coming! I am definitely watching The Genealogists Gadget Bag by my friend Jill Ball, because I was asked to be on that panel. Sadly I could not attend RootsTech this year so had to decline but I'm excited to see what gadgets the panelists are bringing. I also plan on watching my friend and fellow blogger Thomas MacEntee in The Future of Genealogy. If I can possibly do it, I'll watch them all. Recently a marriage record I ordered from the online Manitoba Vital Records website arrived. I don't have ancestors in Manitoba but my two nieces do. Helping them find their Polish ancestry was something I wanted to do but it is proving very challenging. The groom's name is misindexed as Wasyl Ludyjko in the online index but it is actually Wasyl Sudyjko. Mixing up upper case "S" and "L" is a common transcription error in records. The next record that *may* be for Wasyl is the 1906 census for Manitoba where he is listed as "W. Suduk" age 25, single. I had one other clue about Wasyl. I knew that eventually the surname became Sedak and the family lived in Selkirk. Sure enough he was found in the 1916 census for Selkirk Manitoba. This was another example of a badly indexed record - the entire family was listed with the surname Wasil instead of Sedik! The last record I was able to find was a death record for Wasyl in 1922. He was recorded as "William Sedit" born 5 Oct. 1882 [sic] Here his wife's name was given as "Josepha Scukie" We know this is the correct man from other confirmed details given by his daughter to her granddaughters (my nieces). His mother is name as "Mary" and there is no name recorded for his father. So back to the marriage record I received recently. This record shows the parents of both bride and groom, plus ages and birth places. The challenging part is finding out where these towns are today and what their names are (if they have changed) I had sucess finding Wasyl's birth place which is recorded as "Bilcze Zolate Galicia" According to JewishGen it is now called Bil'che-Zolote, Ukraine and is in the Province of Ternopil Oblast, some 460 km SW of Kiev. His parents are named as Michael Sydyjko and Dorka Lueyk or Cueyk. Perhaps one of my readers will have a better idea than I of Dorka's surname. The bride is listed as Josepha Skurycka, 22 born Lycztiwi (? ), Galicia. Her parents are Wajtko Skurycki and Kateryna Kaczrat. Again, help from my readers would be appreciated in the reading of their names and Josepha's birth location. It could be Lycytiwi or I may have misread the last bit "tiwi" but I do not find either listed on JewishGen. One question I have is what would the Polish name be for "Michael" and what would the English name be for "Wajtko"? If anyone knows please enlighten me! And so a marriage record has great information but leaves me still struggling. And I have not yet found Josepha (Josefa, Jessie) on a ship arriving in either Canada or USA. It's always fun and exciting to be exploring a new area of genealogy research but I confess to finding this very challenging indeed. Early Bird Registration for NGS Ends Today! ARLINGTON, VA, 18 March 2013: The NGS 2013 Family History Conference will be held 8–11 May 2013 at the Las Vegas Hotel and Casino (LVH), Las Vegas, Nevada. The early bird registration discount ends Tuesday, 19 March 2013. In addition to enjoying a $35 discount, only early birds have the opportunity to order a printed syllabus. (Everyone will receive a syllabus on flash drive.) NGS members get even deeper discounts, so this is a great time to join. Space is still available for most breakfasts and luncheons, the NGS Banquet, and Tuesday bus tours. The BCG Education Fund Workshop is sold out. To be placed on the wait list, e-mail the NGS conference registrar, Courtney Holmes, at cholmes@ngsgenealogy.org . For those living within travel distance of Salt Lake City, Martinez said it's still not too late to register for RootsTech 2013! From the Getting Started, Developer Day, and the Story@home tracks, the 3rd annual RootsTech conference has something for everyone, whether you are an avid genealogist, just beginning, or simply want to discover the latest technologies and solutions to better connect with your family. For registration details and costs, go to RootsTech.org. Following are the RootsTech 2013 Streaming Sessions and when and where to find them. 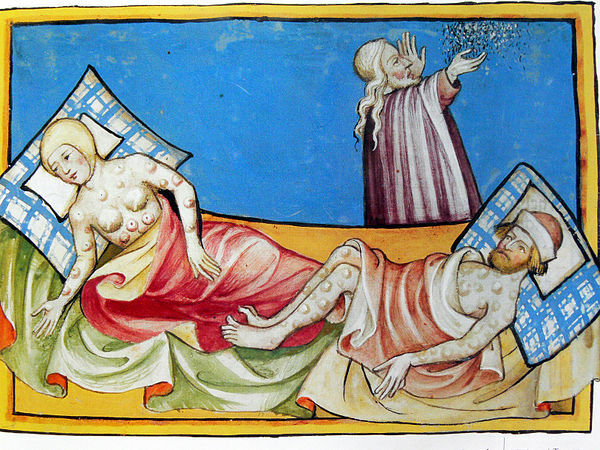 Archaeologists said on Friday they had discovered a lost burial ground during excavations for a massive new rail project in London which might hold the bodies of some 50,000 people who were killed by the "Black Death" plague more than 650 years ago. Thirteen skeletons, laid out in two careful rows, were found 2.5 meters (8.2 feet) below the road in the Farringdon area of central London by researchers working on the 16 billion pound ($24 billion) Crossrail project. 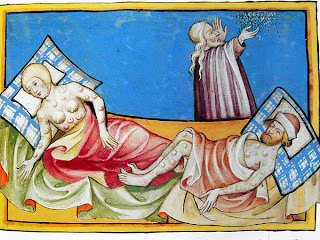 Historical records had indicated the area, described as a "no man's land", had once housed a hastily established cemetery for victims of the bubonic plague which killed about the third of England's population following its outbreak in 1348. Since it's St. Patrick's Day I thought I'd talk a little about two of my Irish ancestors. I don't have that many Irish in my ancestry but my maiden name (McGinnis) is Irish. Many of my readers know that I'm always looking for Joseph McGinnis and his wife Fanny Downey who came from Co. Down in 1846 and settled near Guelph Ontario Canada. 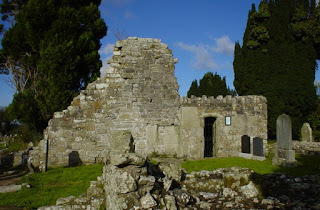 But today I want to share a bit about my Irish 3rd great grandparents John Greenlees and his wife Elizabeth Johnston. 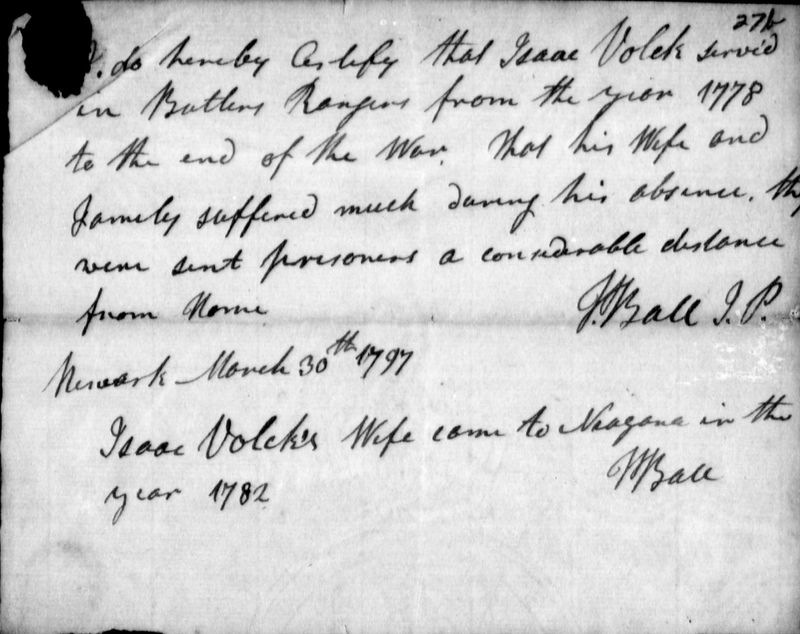 John and his wife came from Ireland to Ontario sometime between 1819 when their daughter Jane (my 2nd great grandmother) was born, and 1822. Unfortunately ships passenger lists to Canada before 1865 did not have to be archived and so they are few and far between. So far I have not found any record of their arrival but Ontario was a very young settlement in those years and the courage they had to make the journey with three young children astounds me. I know a lot about John and Elizabeth during their years in Ontario. But I've never known where in Ireland they lived. And then came great news from a fellow researcher and descendant. John Greenlees of P'h of Aghalurcher & Eliz'th Johnston of Drumy. I can't begin to describe how it feels to have not only a county but an actual parish in Ireland after years of only knowing "Ireland" as their place of origin. Today I treated myself to doing more searching for John and Elizabeth Greenlees, and to reading about Aghalurcher. I am not sure what "Drumy." stands for except perhaps Drummally? If anyone knows I'd love to hear from you. Nothing turned up for John or Elizabeth but I did get sidetracked looking for some of hubs' Irish ancestors - and had great success! I'll blog about that another day. Records of U.S. Army officers and soldiers killed or wounded in the Korean War are now available on Fold3 . Korean War Casualties is available free to any visitors to the site. One quarter of the nearly 110,000 records in Korean War Casualties connects to information about Army personnel who died during the war, 1950-1953, including those who died while a prisoner of war or missing in action. The remaining three quarters are for nonfatal Army casualties. The Korean War Casualties database is from the Records of the Adjutant General's Office, 1905-1981 (Record Group 407), at the National Archives (NARA). It was compiled between 1950 and 1970, and covers the period from the earliest casualty (February 13, 1950) to the latest date in the date of disposition field, December 31, 1953. The information on each casualty may include: name, service prefix and number, grade, Army branch, place and date of casualty, state and county of residence, type of casualty, detail/previous casualty type, casualty group, place and date of disposition, year of birth (for deceased casualties only), military occupational specialty, organization troop program sequence number, element sequence, unit number, race, component, and disposition of evacuations. When you find a soldier in the Korean War Casualties records on Fold3 , you’ll link directly to a memorial page for that soldier where we invite you to add stories, photos, documents, and other information relating to that individual. Examples of two pages to which newspaper articles were added include twice-wounded Purple Heart recipient Dwight L. Huston, of Mt. 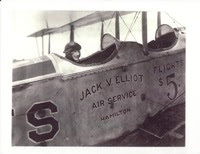 Vernon, IL; and Pittsfield, MA, native Arthur A. Boland. When added to the memorial pages, your stories and photos help sustain the memories of United States heroes in the Korean War and allow others to connect with and honor them. 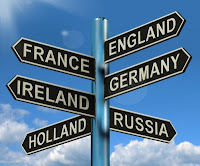 15th-16th of May 2013 The Institute of World History of The Russian Academy of Sciences is organizing an international conference “Russia and The Netherlands in the XVIIth – XXth centuries: new researches and actual problems”. 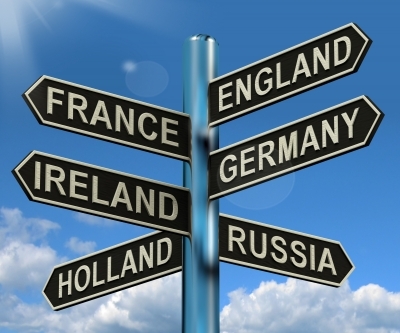 The conference will be held in conjunction of “The Year of The Russian Federation in The Netherlands” and “The Year of The Kingdom of The Netherlands in Russia” in 2013. As a part of the conference there will be a round table concerning the study of the history of The Netherlands. All the scholars who have a special interest in the history of this country and also authors of the relevant textbooks are welcome to take part in this round table. It will take place in the Institute of World History, the Russian Academy of Sciences. It is in the main building of RAS. Women's History Month: Have You Tested Your mtDNA? You can read about my mtDNA results at mtDNA Test Results Arrived! I am still struggling to understand my mtDNA results and hope that when my 23andMe test results arrive I will have a better grasp on what it all means. The Anticipation of Snail Mail!